How comfortable is your current toilet? Most people enjoy sitting on the toilet they have and even if they don’t, they tend to get used to the seat they have. You won’t know what you’re missing, however, if you don’t own the Kohler Cimarron which has a comfort height design. This toilet is built with the average person in mind, designing the height of the toilet to match the average chair height that is found today. It comes with 7 unique finishes to compliment virtually any bathroom and it’s affordable. You can find it priced on Amazon for less than $350 right now! What Are the Features of the Kohler Cimarron? The primary feature we really loved about using the Kohler Cimarron was how it has been designed to make installation an easy, better process. Of note is the Dry-Lock system that is included with this toilet. It helps you get the installation done right without much of a hassle and provides a foundation where you can keep the floor dry, eliminating the possibility of dry rot around the fixture. It is definitely one of the easiest toilets to install today! this toilet has Class Five flushing action that helps to eliminate bulk waste items so that every flush can be completely worthwhile. Although the idea of having a low flow toilet can be a little imposing at first, especially if you’re going to less than the new 1.6 gallons per flush standard, the transition is pretty easy thanks to the Kohler Cimarron. It has a lot of power at this flow rate and will give you a consistent experience each and every time. Does the Kohler Cimarron Have Any Advantages? When considering the advantages that can be had with this particular toilet, it’s really about how form meets function when you’re using this in your home. The standard ADA compliant toilet height is 16.5 inches and this toilet is a little higher than that, coming in around 18 inches or so. That’s a bit tough for some smaller folks, of course, but overall the more upright sitting action creates a more comfortable bathroom experience when needed. It is difficult to find a design flaw or problem with this toilet. 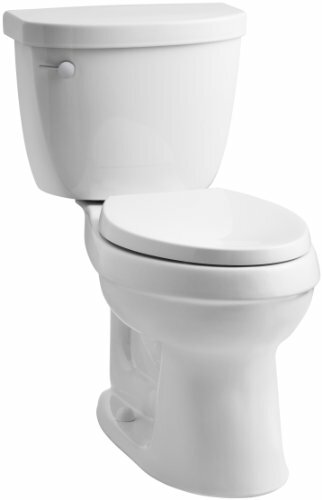 As with any low flow toilet, it is a little difficult to flush large amounts of waste at the same time. The paper that gets stuck above the water line can be difficult to remove just by flushing, but with careful management can be handled fine. That means you’ll end up saving a lot of water with every flush and save a lot of money on the extreme affordability of this toilet too. For the household on the budget, this is the perfect toilet. Click here to compare prices on Amazon and get the best price on the Kohler Cimarron Comfort Height Toilet.